Cycling or club related news. A team based fun cycling event for a bit of fun to see if they can work out the clues and navigate to each destination by the quickest or shortest route! Teams will be given their start pub location in he morning on the day. Clues to the following pub destination will be issued. Teams will have to navigate to each of the 5 pub locations however they like in turn using the clues given, before each team navigating to the final 6th pub. Maybe finish off with a couple of drinks and dinner with everybody at the end. 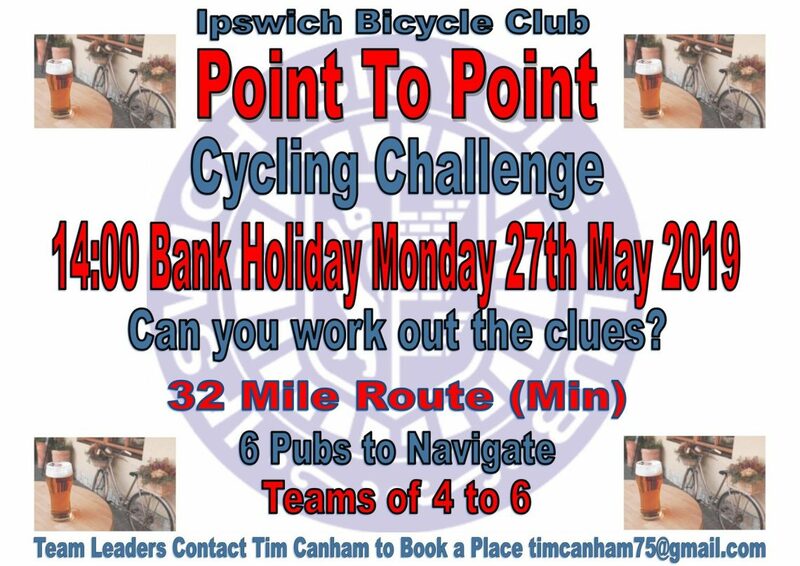 Final pub location is within easy reach of Ipswich, so cycling home wont be an issue. Clues will be sent to each team via messenger, text or similar. Proof of all team members being at each location must be given prior to receiving next clue. We now have a Ride with GPS Club Account. This gives all members full access to the enhanced features of the club account. This allows us to build up a library of routes used by the club. We have already added TT routes, Reliability Ride routes, local sportive routes and many SSR routes. When joining the club account you will be asked to set up a personal account which will run parallel to the club account. This is a free service. For help with using or getting it setup, get in contact with the club, we also plan to run a demo and Q&A at the June Social Night. The IBC Reliability ride will be on Sunday 3rd March starting from Fynn Valley Golf Club. We’ve got 3 routes available: 75 miles, 55 miles and 36 miles. £3 entry on the day. Food and refreshments will be available to buy on the day, as well as car parking and showers. The club awards evening is approaching fast! This year it is on February 23rd from 7pm, at Curve Bar in Ipswich town centre. Come along for some food and drinks with your fellow club members, plus the awards raffle, the photo competition, and to see who has won this years awards. The cost is £12 per person and you can pay directly through PayPal using the button below. As it’s the start of the year, the Reliability Ride season kicks off soon. For those who don’t know, Reliability Rides challenge people to ride a certain distance in a certain time (not too fast though! ), as a test of the season ahead. More info will be published soon on the IBC Reliability Ride, which will hopefully have better weather conditions than the last 2 years! IBC will be having it’s Christmas Social in the Dove Street Inn on St Helen’s Street, Ipswich, on Thursday 13th December from 7pm. A chance to meet and catch up with your fellow club members while having a celebratory Christmas drink or two. Christmas jumpers are encouraged! We’re also going to be having club kit on sale too for you to buy, but will only be able to take cash this time as payment. On the 19th November the newly elected committee met for the first time since the AGM. Several issues were discussed including the new club paypal, the awards night, and club kit supplies and distribution. We’d also like to remind members we still have committee spots open, get in touch if you’d like to volunteer. There won’t be a meeting in December due to availability round Christmas so the next meeting will be Monday 21st January. Next Thursday, 1st Nov, is our club AGM. Come along for the chance to see how the club’s run, have a chat on ideas for the club, maybe consider volunteering for one of the open committee positions, and vote on club member of the year. 7pm Thursday 1st at Greshams. Coaching Secretary, Time Trial Secretary, Youth Representative, Ladies Rep and Male Rep.